The C 200 h auto package allows operating the C 200 with a completely automated water cycle. This results in ease of handling and saves valuable time especially for laboratories with a low number of analyses. The water circulates in a closed loop and is kept at a constant temperature by using a recirculating chiller. This leads to shorter preparation time for each experiment and even better reproducible results. 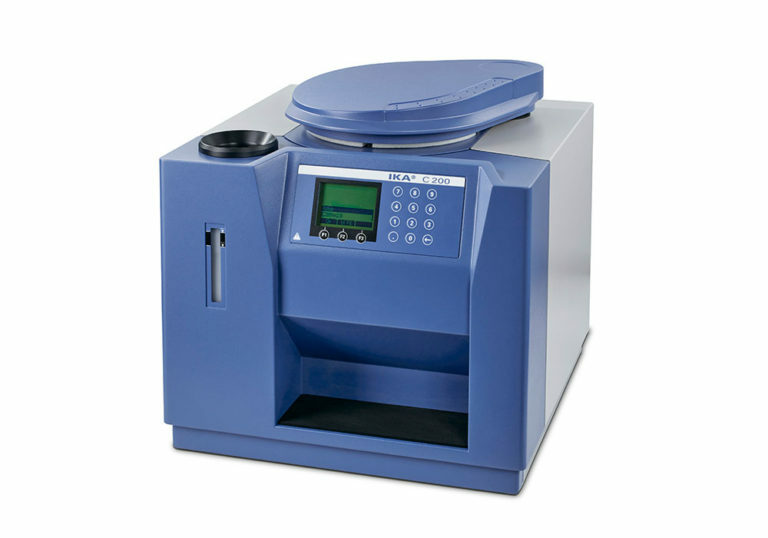 The semi-automated and conforming-to-standards combustion calorimeter determines the gross calorific value of liquid and solid samples. So far it has mainly been used for teaching and training purposes at technical schools and universities. Due to the automated water handling it is now also suitable for industrial laboratories with low number of analyses. The catalytic activated, halogen resistant decomposition vessel C 5012 is specifically designed for the combustion of samples that contain halogens and sulfur ( > 3 % ). The material of the decomposition vessel (Hastelloy) prevents corrosion caused by samples with high chlorine content. The catalytic activated inner-surface leads to higher recovery rates in case analysis of halogens and/or sulfur is required after the combustion. Measurements are possible according to e.g. DIN 51900, ISO 1928, ASTM D240, ASTM D4809, ASTM D5865, ASTM D1989, ASTM D5468, ASTM E711. The software C 6040 CalWin controls the unit and monitors the measurement of the samples. Additionally, collected data can be exported to e.g. Excel, Word, SQL and LIMS for further analysis. It is possible to operate several calorimeters with one PC. A PC is not part of the scope of delivery and needs to be provided by the operator. CalWin is sold separately. Achat et vente de matériels scientifiques et d'équipements de laboratoire. Étude, audit, analyse, interprétation et expertise sur tous matériaux, matières premières et produits. Formations scientifiques et techniques.